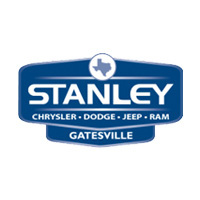 If you need auto service at a price that won’t break the bank, take advantage of the Chrysler, Dodge, Jeep, Ram oil change coupons and auto repair coupons at Stanley Chrysler Dodge Jeep Ram Gatesville! We routinely rotate our service specials so that you can make use of everything from brake service coupons to great prices on tire services. Before you schedule your next service appointment in Gatesville, do yourself a favor and peruse our current auto service coupons. Whether you’re on the hunt for oil change specials or auto service coupons, our attentive and highly-trained service department will accommodate you and your your Chrysler, Dodge, Jeep, Ram. Contact us at your convenience to learn more about our available service specials! Rotate four tires. Some vehicles may be higher. Customer is responsible for local tac and Shop Supplies fee. FCA US LCC vehicles only. © 2015 FCA US LLC. All Rights Reserved. Chrysler, Dodge, Jeep, Ram, Mopar, SRT and HEMI are registered trademarks for FCA US LLC FIAT is a registered trademark of Fiat Group Marketing & Corporate Communication S.p.A., used under license by FCA US LLC. Inspections of these and additional items not listed: tires/tire pressure, Windshield wipers, Exterior lames, Cooling system mixture/leaks, Air filter, Fluid levels, Belts/hoses (excludes timing belt). Price does not include repairs, which may be required after inspection. See Service Advisor for complete details. Customer is responsible for local tax and Shop Supplies fee. FCA US LLC vehicles only. © 2016 FCA US LLC Fiat is a registered trademark of Fiat Group Marketing & Corporate Communications S.p.A. used under license by FCA US LLC. A/C system performance check. Refrigerant and testing compnents for leaks are extra. Customer is responsible for local tax and Shop Supplies Fee. FCA US LCC vehicles only. © 2015 FCA US LLC. All Rights Reserved. Chrysler, Dodge, Jeep, Ram, Mopar, SRT and HEMI are registered trademarks for FCA US LLC FIAT is a registered trademark of Fiat Group Marketing & Corporate Communication S.p.A., used under license by FCA US LLC. Everyone wants better gas millage and a Fuel Injection cleaning will do the trick! Gas and Diesel engines can be cleaned! Includes: Oil & Filter Change, Four Tire Rotation, Exterior Car Wash, Brake Inspection, and a rigorous Multi-Point inspection. Coupon not valid with any other offer. Must present coupon at time of purchase. Limit one coupon per person. Coupon does not apply to prior purchases. Other Restrictions may apply. Void where prohibited. Up to 5 quarts of conventional oil. Excludes diesels, synthetic oils, and specialty vehicles. Get 20% off your maintenance service package! This is offered to all TDJC Employees and must present an I.D. or paystub from TDJC. See your Dealer Today to apply! **See the rewards terms and conditions in the summary of credit terms provided at the time of application for details, including earning, redemption, expiration or forfeiture. Percentage back is earned as points. Cards are issued by First Bankcard, a division of First National Bank of Omaha pursuant to a license from MasterCard International incorporated. MasterCard is a registered trademark, and the circles design is a trademark of MasterCard international Incorporated. See dealership for complete details. 2019 FCA LLC. All Rights Reserved. Mopar is a registered trademark of FCA US LLC.